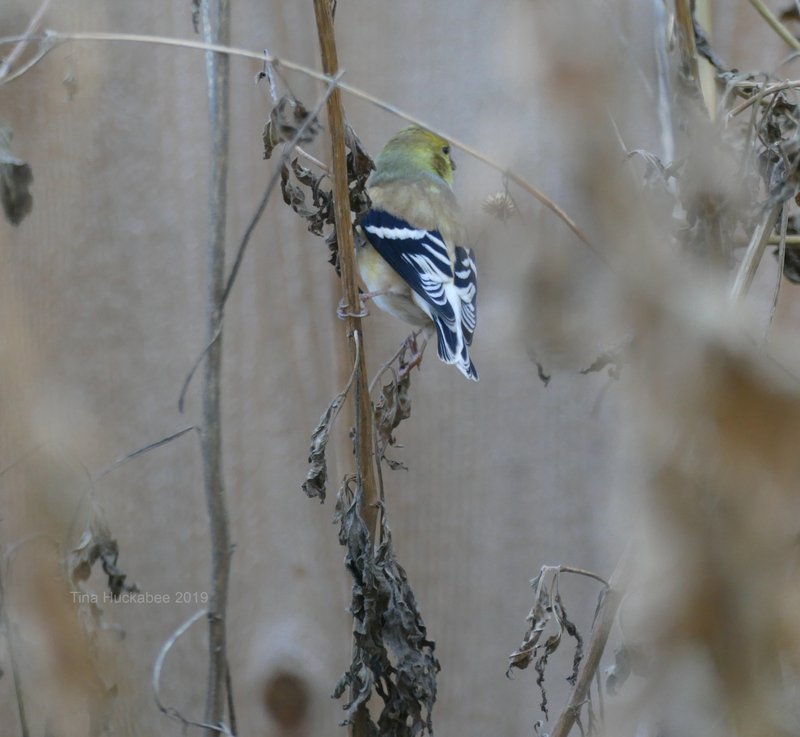 This entry was posted in American Goldfinch, Carolina Chickadee, House Finch, Native Plants Gardening, Orange-crowned Warbler, Uncategorized, Wildlife Gardening in Ausin, Wildlife Habitat, Wildlife Wednesday and tagged Backyard Birding, Biodiversity by Tina. Bookmark the permalink. 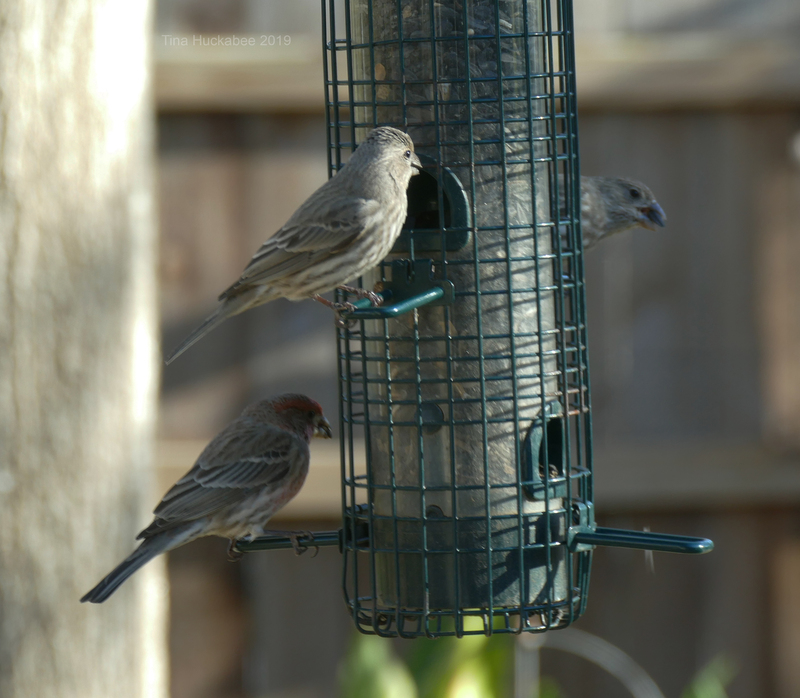 I am thankful that your post included the downside of bird feeders. It’s one of the many things that should be done right or not at all. Great photos. I also love bird sounds. They are such busy little creatures. Good job here Tina. Yes, there is a downside and I agree: done right, or not done at all. I’m enamored with birds, so interesting and remarkable! My husband always asks me why I have “dead” plants in the yard. Not only do they feed the birds, they reseed for next year. 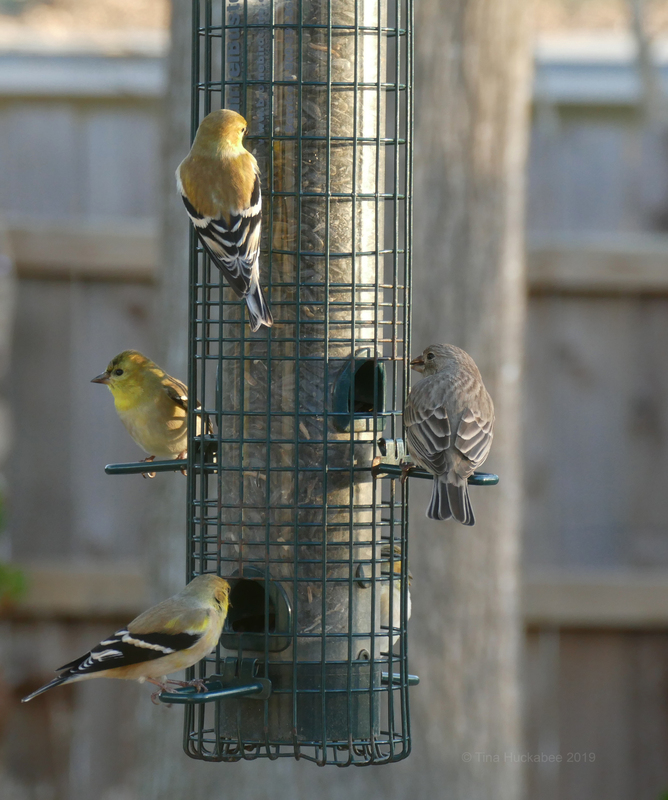 My large flock of Goldfinches suddenly left. Sometimes I have a late spring flock come by. Haha–my neighbors ask the same question! 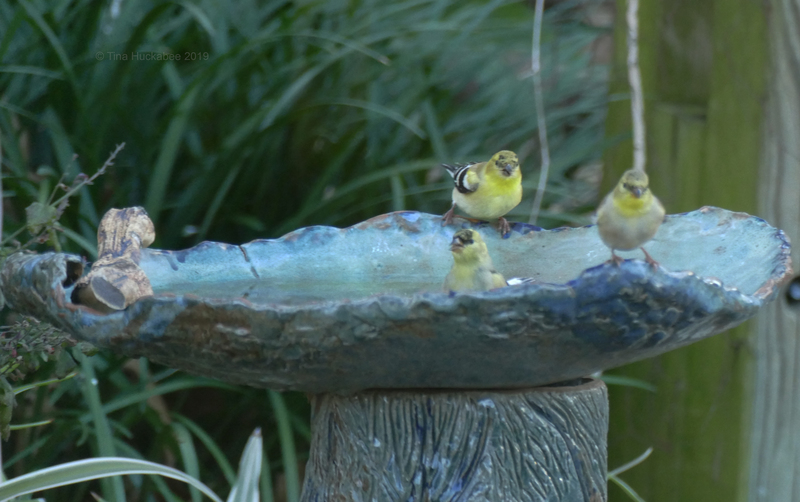 The goldfinches are so funny–one day there in droves (flocks, I guess), next day–gone, gone, gone! Tina, I enjoyed your new drop-down menu selection. I am lucky to live in a rural environment surrounded by plenty of hedges, fields and set-aside, which loads the dice in favour of an abundance of wildlife. I endeavour to cultivate small areas of native weeds, like teasel and nettle, to encourage things like finches and butterflies, but elsewhere it is war to hold the natives back! Thanks, Allison. I’ve been meaning to get it up and going for a while and finally did so! You are so fortunate to live in a rural environment–I’m pea green with envy! Thanks for the fun post, Tina, and for helping to spread the word on using natives and letting them stand during the winter. 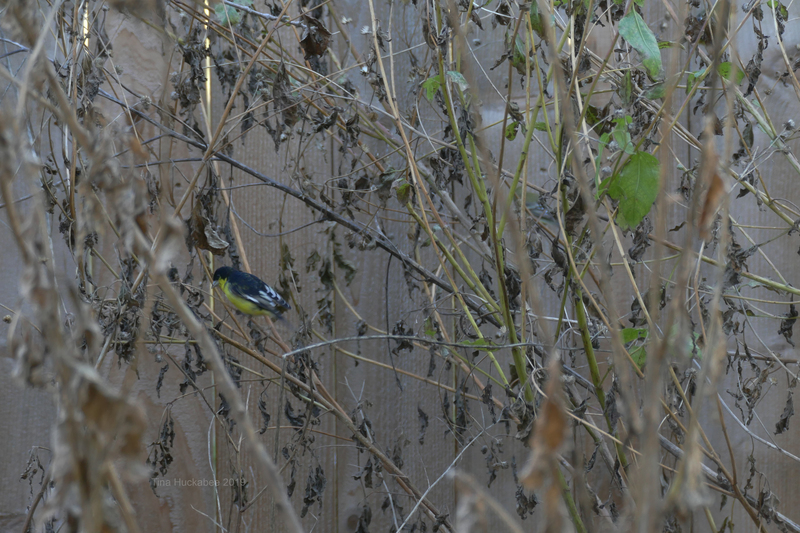 I also garden for birds and wildlife and love to watch the goldfinches on our Plateau Goldeneye seed stalks. 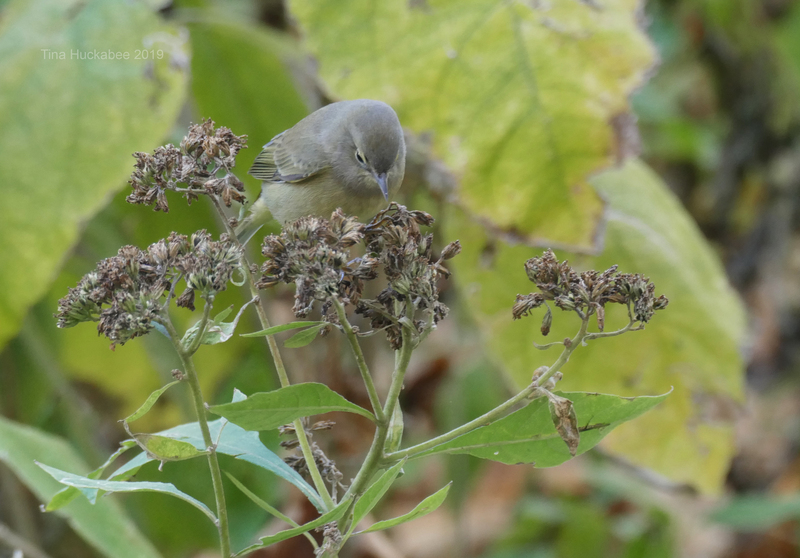 I don’t know if you are interested in birding outside your yard as a hobby, but if you are, you might enjoy one of the monthly gatherings at Hornsby Bend in east Austin. On the second Saturday of each month (this weekend), I help my husband in leading a group survey of all the birds on the property. It would be fun if you joined us some time – I would love to meet you in person! 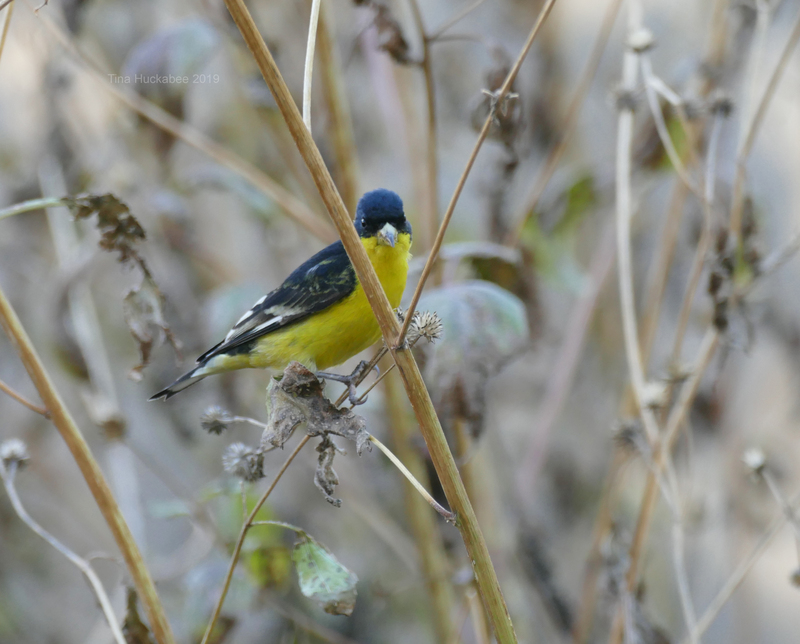 And the 3rd Saturday of each month is a birding walk led by Travis Audubon. Feel free to ping me if you are interested in more details. I am interested and am a member of Travis Audubon! Mostly, I just attend the monthly meetings, but I’d like to get more involved. The thing about birding are those early hours…. :) But I’ll sure keep you guys in mind. I have thought I might write a post titled “My garden is ugly on purpose.” I also started with native plants primarily for the ease and low water use aspects of gardening. When the pollinators and especially butterflies showed up in droves it was a bonus. A butterfly garden without even trying! 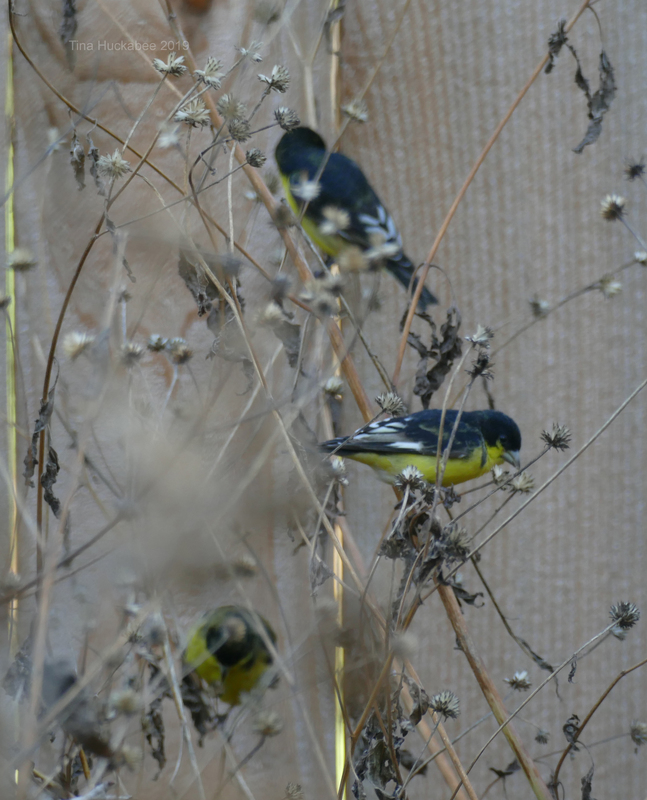 You’re right about the goldfinches. They’ll swoop in, and then swoop right back out. It’s interested me that they will feed on the crepe myrtles. My apartment complex has stopped that ghastly practice of cutting the trees back to their nubs in early spring. Instead, they leave the seed pods on the trees until just as the new growth begins appearing, and then they trim them. I love the prairies at this time of year for just the reason you mention — it’s like a huge buffet table for the birds and critters. Besides, the seed pods and drying plants are attractive, too. You just have to get used to looking at them for what they are, and not what they aren’t! 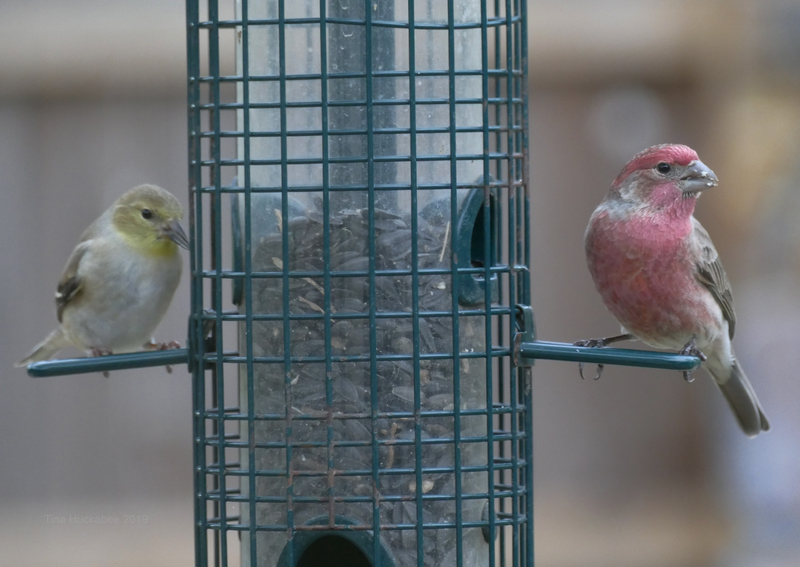 I’ve learned a couple of things about bird feeding in the past years, and one thing is to be sure your seed supplier is a good one. “Deals” on the internet often end up being poor quality seed, and even places I once thought were perfect sources, like feed stores, aren’t always. If there’s not enough turnover, seed can sit on the shelves forever. I got a bag like that recently. None of the birds would touch it, and it finally occurred to silly me that there was something wrong with it that they sensed. I threw it all away, got some fresh, and they started chirping again. Firstly, good for your apartment complex landscape staff. I cringe everytime I see crepe myrtles mutilated like so many are. Ugh. Prairies have it down, correctly. They’re biodiversity goldmine. I also find seedpods and dormant plants attractive, many are downright beautiful. I’ve had the same experience with bird seed, but I keep it simple now, just the black-oiled sunflowers and I usually get mine from Lowe’s. There’s a brand (name escapes me at the moment) which is Audubon approved. Fingers-crossed it’s what the birdies need. 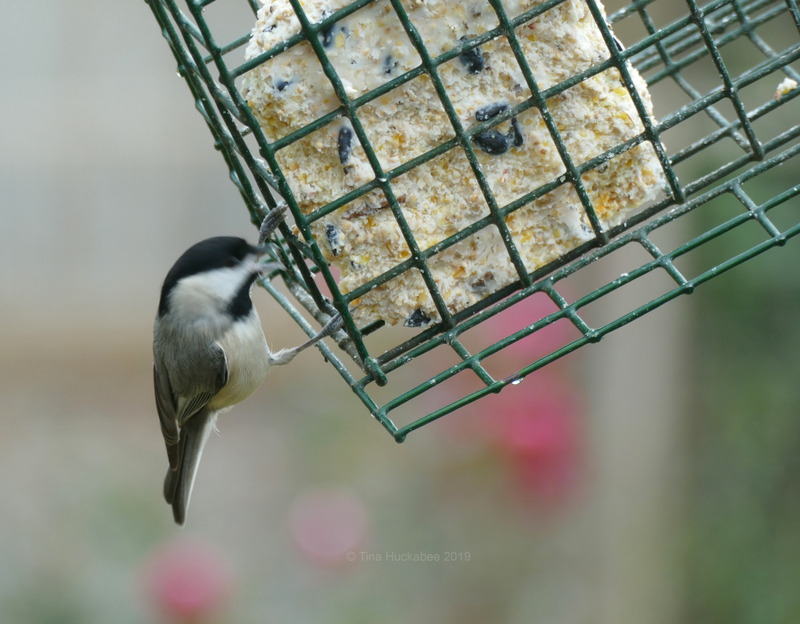 I learned about such bird feeders when I cut a bunch of sunflowers from the garden and put them in a big vase on the table in the dining room many summers ago. 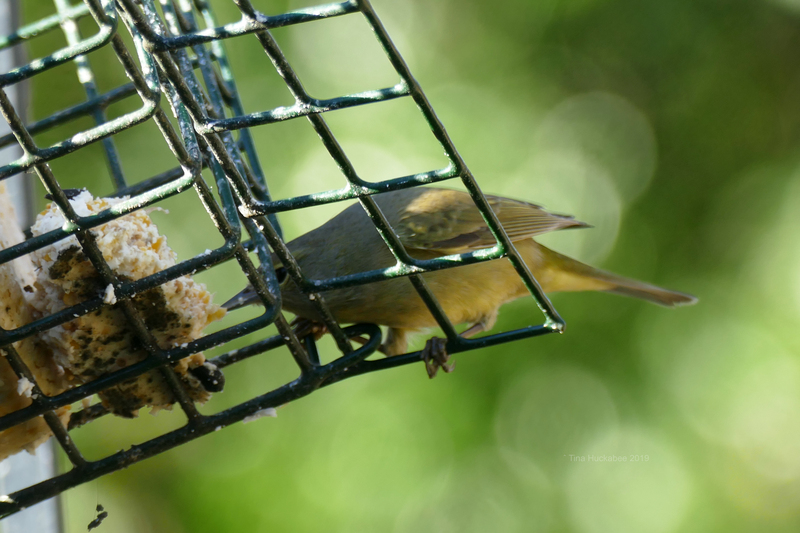 The finches dined in style. What a mess! Haha–you’ve told that funny story, though I’m sure it wasn’t much fun cleaning up! No, but too funny to not laugh about it. I always enjoy your fabulous bird shots. Thank you, Chloris. 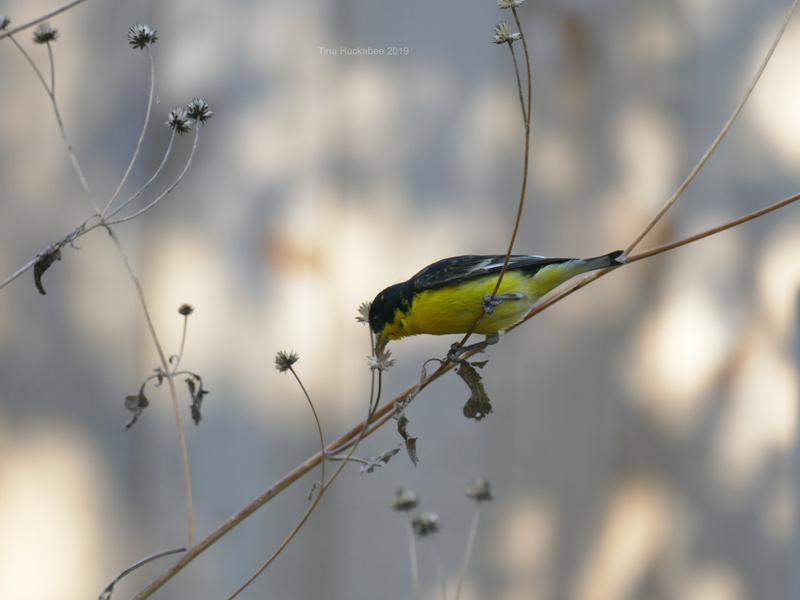 I’m learning; bird shots are tough–I wish they’d sit still longer! 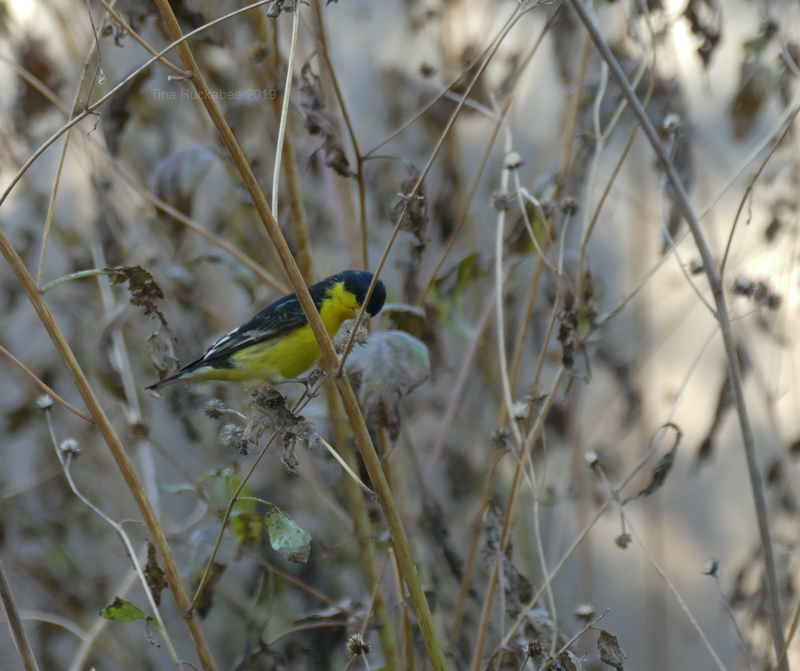 I really like those Lesser Goldfinches. 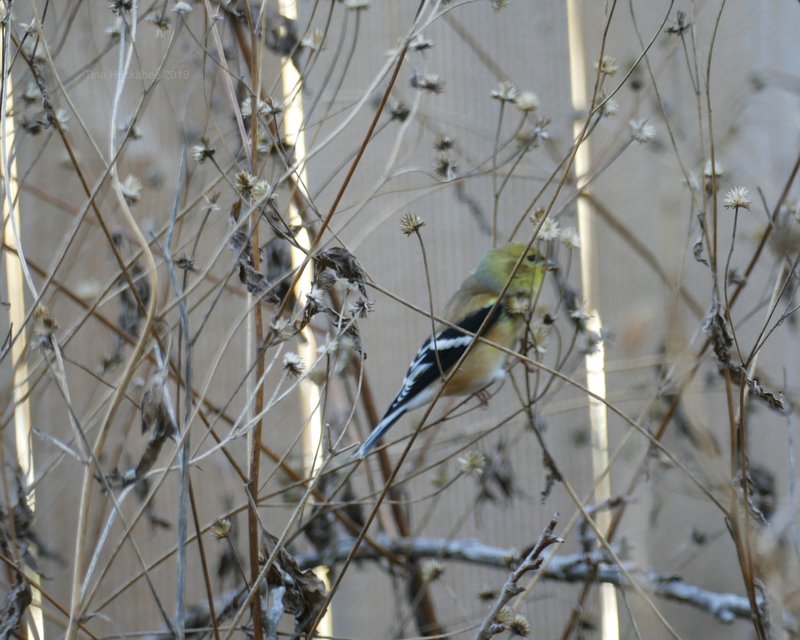 There is nothing “lesser” about them – they look better than the American goldfinches, at least in winter. I agree! So snazzy in that black and yellow garb.